Here's our Memorial Day edition, in honor those who have fallen serving our country. We have another big week in store - with Issa's Town Hall and the March for Truth on June 3, as well as our Tuesday rally in Vista. 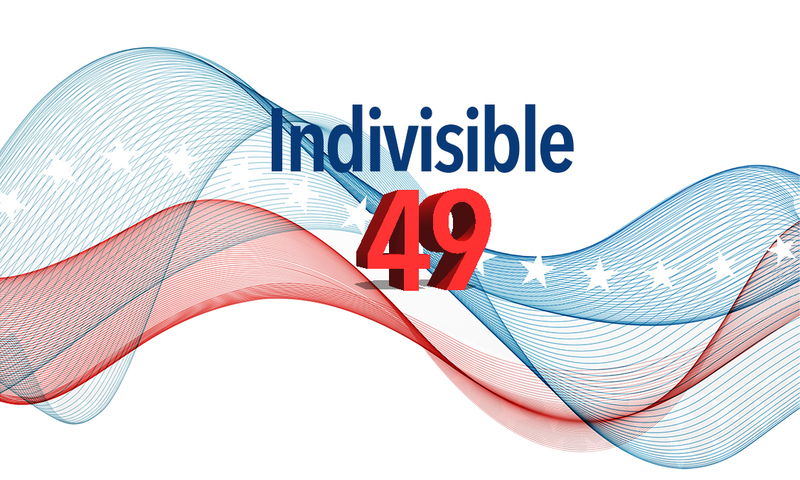 Also, we're happy to announce our first full Indivisible 49 membership meeting on June 11 at 6:00 p.m. at the Carlsbad Senior Center (details below). Many of you know that we face challenges with getting a permit for our Tuesday rallies. Our intrepid Ellen Montanari will keep on protesting as long as we do! Check out the San Diego Union-Tribune coverage, including a video of our 800+ strong health care protest. It's no surprise that Darrell Issa made the list in this New York Times Op-Ed: Republican Hypocrisy Hall of Fame. Did you know that the weekly rallies at Issa's office are the largest weekly rallies in the country! Keep up the good work. We join other committed groups in keeping the pressure on Issa. 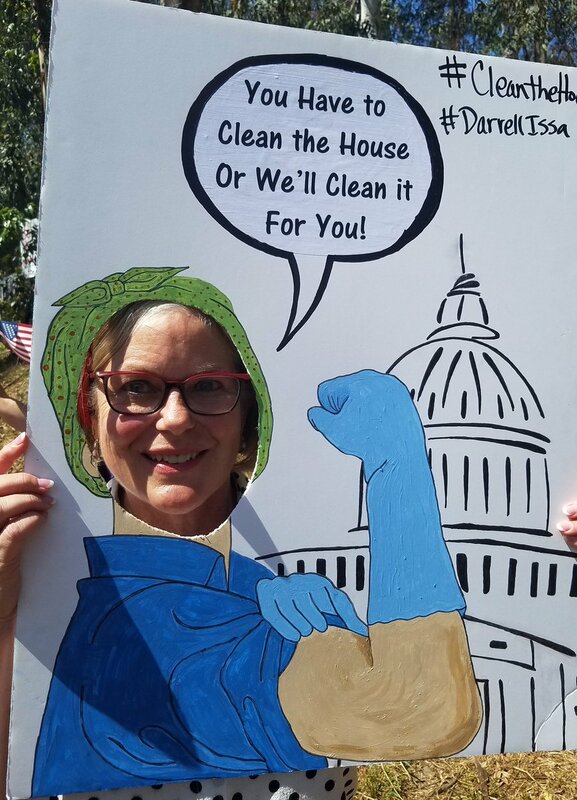 Thanks to the hundreds of resisters who showed up to "clean (the) house" with mops, brooms, kerchiefs, and gloves! When Ellen and a small group dropped off buckets full of sponges, Issa's District Director slammed the door on them! More photos here. May 30: Tuesday Rally - "Darrell, You're Toast!" Rally at Issa's office again this Tuesday at 10:00 a.m. This week’s theme is “Darrell, You’re Toast!” Feel free to attach a toasted piece of bread to your sign this week :) We will deliver a gift to Issa's office during the rally. We're gathering across the street, so please be careful crossing over. Look for Ellen's email to RSVP. Note: For those of you who haven't seen Ellen's heartfelt email, she has graciously and bravely committed to keep our rallies going, despite local Republicans' many roadblocks to obtaining permits. Please follow all safety instructions at the rally - Ellen is personally responsible to pay all costs if the Sheriff’s deputies are called. ACLU Observers will be at all future rallies. Come join us even if you don't have a ticket - very few of us were able to get one! We plan to arrive at 8:00 a.m. RSVP here. Issa has attempted to keep us away from his town hall by limiting tickets (he sent a secret code to supporters who snagged tickets early) and overlapping with the March for Truth. Sign up for the Town Hall waitlist here, and join us outside for a show of strength. Ellen's leading our own March for Truth following the Town Hall, at 10:00 a.m. More news as the day approaches. CNN will be there, along with most other major news networks. Let’s show them that we do NOT support Issa! If anyone has tickets but can't go, please forward them to Ellen Montanari who'll distribute them. Want to carpool? We set up this website. This march is to call for a special prosecutor/independent investigation into Trump's ties with Russia. Gather at the Mission Bay Visitor Center at 11:00 a.m., then march to the I-5 overpass and rally there. See details and RSVP here. Wear orange if you're joining San Diego Moms Demand Action to march and send a powerful message that there is more we can do to end gun violence. Details here. We're looking forward to getting everyone together at our first full membership meeting. With a theme of "Finding your Activism," you are invited to join various breakouts sessions including Voter Engagement, Write Back @ You, Who's Your Buddy, and Social Media Engagement Beyond Facebook. We could use your help in getting ready. Please sign up here and someone will contact you. If you have questions, please text Ellen Montanari at 858-775-0031. Please note that this document is 2 pages. Thanks! Call both Senators to demand that they reject TrumpCare in any form. Make sure they know we appreciate their resistance to Trump's agenda, and will not accept any level of support for TrumpCare. Congress is on recess for Memorial Day. This is a great week to put pressure on both Senators to reject TrumpCare in any form that it takes. Make sure to let Senators know we are watching them and will not accept compromise when it comes to the health of millions of Americans. Click here for full briefing!